According to IBISWorld, the industry is experiencing steady growth as the economy continues to grow and car wash operators reap benefits of rising employment and per capita disposable income. Lower gasoline prices have also encouraged a greater amount of car use. As a result, consumers are more likely to purchase discretionary services such as car wash and detail services. Demand for services provided by the car wash industry is expected to continue to expand over the next five years at a somewhat slower pace than the previous five-year period. The International Carwash Association estimates that total annual car wash sales revenue now exceeds $24 billion, up from $19.6 billion in 2011. The total number of motor vehicles in use has long been considered an indication of the demand for car wash and auto detailing services. 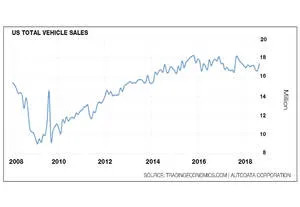 Total annualized vehicle sales (TVS) in the United States increased to 17.4 million in September from 16.7 million in August of 2018. TVS in the United States averaged 15.6 million from 1993 until 2018, reaching an all time high of 21.8 million in October of 2001 and record low of 9.1 million in February of 2009. Another factor known to have an effect on car wash industry revenues is climate and the weather. Average annual temperature for contiguous United States was 54.6° F or 2.6° F above the 20th century average. This was the third warmest year since record keeping began in 1895. During the year, the United States experienced 16 weather and climate disasters with losses exceeding $1.0 billion with total costs of approximately $306.0 billion — a new U.S. annual record. Five states — Arizona, Georgia, New Mexico, North Carolina, and South Carolina — had their warmest year on record. Above-average precipitation was observed across the nation with much-wetter-than-average conditions across parts of the West and the Great Lakes region. Michigan had its wettest year on record whereas below-average precipitation was observed in parts of the Southwest, Northern Rockies, and Northern Plains. Several large-scale flood events impacted the nation during 2017 including the record-shattering rainfall across Texas and Louisiana associated with Category 4 Hurricane Harvey. Drought conditions changed dramatically throughout 2017. The year began and ended with about one-quarter of the contiguous United States in drought. The footprint reached a low of 4.5 percent in late May, the smallest drought footprint in the 18-year period of record. Heavy precipitation during the winter season caused significant flooding and record high snow pack across the West and helped to end a multiyear drought impacting California and Nevada. However, the wet winter allowed vegetation to flourish creating an abundance of fuels for wildfires during the subsequent dry season. The car wash industry is highly fragmented and competition among industry participants is high. Industry operators also face competition from companies outside the industry such as convenience stores, gas stations, and automobile dealerships, and, more recently, on-demand mobile waterless car wash operations. According to the List of Top 50 Carwash Chains, the top five slots have been dominated for the past three years by Mister Car Wash, Autobell Car Wash, Wash Depot Holdings, Goo-Goo Express Wash Inc., and Boomerang Car Wash, the last of which was acquired by Zips Car Wash in August 2016. The top 50 list represents over 1,500 establishments, which accounts for roughly 2 percent of the estimated 80,500 total car wash locations in the United States. Competition amongst suppliers is also high and reflects an interest by the current wave of investors to minimize the number of players involved in acquiring and developing car wash properties. Today, manufacturers are trying to achieve this by integrating equipment, controls, chemical, parts, education, sales, and support. For example, Sonny’s Enterprises LLC has launched OneWash™ a complete suite of business solutions designed to simplify daily operations and management of any sized car wash.
National Carwash Solutions (Ryko/MacNeil) dovetailed on this with its integrated solution called “The MacNeil EDGE™” a complete bundled solution, all-in-one tunnel program. Its Ryko brand introduced its own all-in-one solution called Ryko 360º. According to Sonny’s CEO Paul Fazio, the industry has gone from family-owned-and-operated to investor-owned-and-operated to private equity-and-institutional-owned-and-operated. The group that prevails will be the one who understands the science of car washing down to its roots — clean, dry, and shiny. According to a presentation given at The Car Wash Show 2018 by George Odden with Commercial Plus, merger and acquisitions in the car wash industry is strong with large players and private equity groups consolidating. Reportedly, over 200 car washes were purchased by the top consolidators alone in 2017 with an estimated sales transaction total of over $1 billion. Ancillary service companies are also being actively targeted. DRB Holdings LLC, dba DRB Systems (acquired by New Mountain Capital) acquired Sage Microsystems and Nopileups. Sonny’s The CarWash Factory acquired Mr. Foamer and Diamond Shine. Tommy Express picked up Navigate Creative Works, and Kleen-Rite acquired Towels by Doctor Joe. National Carwash Solutions (acquired by AEA Investors) was very busy during the year forming strategic partnership with several firms. These included TSS Car Wash Services (signs) and at least six major equipment distributors covering 14 different states in the southeast, Midwest, and west regions. Other notables included Istobal’s strategic partnership with Andretti Petroleum Group and Mark VII’s partnership with Wash-N-Shine to provide service in Kentucky, Ohio, and Indiana. In real estate, ALN reported over 21 acquisitions by Mister Car Wash including properties located in Georgia, Michigan, Alabama, New Mexico, and Missouri. ALN also reported 10 acquisitions in Georgia, South Carolina, Tennessee, and Florida by Little Rock, AR-based Zips Car Wash.
On the other hand, there were company’s that expanded organically such as Tommy’s Express and Quick Quack Car Wash chains. For example, Tommy announced 55 Tommy’s franchise locations were under contract around the country, and Quick Quack announced it has 12 sites under construction and more than 50 under contract for the future. Iridescent lava foam, light shows, and spinning brushes with LEDs may draw a lot of attention but it’s digital technology that is reshaping how car washesdo business. For example, point-of-sale units with push buttons have become passé. Consumers expect touch screens, high-speed data processing, and the option to pay with their mobile devices. Digital and mobile app technology has allowed for the creation of digital car wash networks. Most recently, this has included Everwash and Superoperator. Digital technology has allowed each of these companies to create a distinct car wash company without the risk of owning real estate, buildings, or equipment. Technology is also posing certain challenges for car wash operators. According to one equipment manufacturer, there were more technical problems with modern vehicles reported than ever before. Usually the issues involved collision avoidance systems, electronic parking brakes, automatic wipers, and keyless entry systems. Unintentional activation of these devices may lock up wheels causing vehicles to stop in their tracks and risk collision with those behind, causing windshield wipers to engage and be torn off by the brushes, and locking all doors until the customer rescues the vehicle. Another technological challenge car wash operators may face is hacking. For example, in a presentation given at a recent Black Hat USA event, researchers Billy Rios and Jonathan Butts, PhD, related how they were able to create a fully automated software attack script to exploit an in-bay automatic car wash in a manner to cause a safety concern. In short, exploitation of the car wash included identifying hardware and software safety mechanisms, authentication bypasses, safety signals, and door and arm manipulations. The safety implications were that the researchers could trap an occupant inside the car wash, strike the vehicle or customer with the bay door, and strike the vehicle or customer with an arm. A more detailed exploration of this issue starts on page 70 of this issue.